Whether you are raising money for sport uniforms or the PTO, bake sales are a fun and profitable way to earn money. 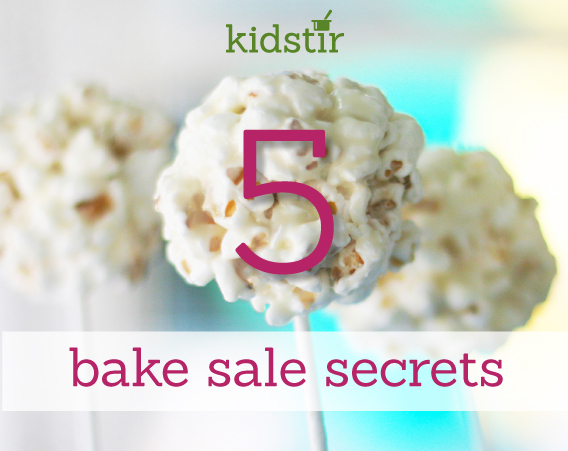 Enlist the help of fellow bakers—including kids who love to cook—then get baking. Post signs around the school or sports sidelines, add price tags, and treat names (see our downloadables). Here are some creative ideas for what to sell at your sale. Make your bake sale fun by serving cookies, cake pops, crispy rice treats, popcorn balls, and other sweets on lollipop sticks. Wrap them in plastic and add a tag. Instead of selling brownies and cookies individually, bundle them up in bags of 2 to 4 and tie with a bow. You’ll earn more than you will off of single sales. Plus, the bundles are easy for customers to grab and go. Set out bowls of trail mix filling (granola, sunflower seeds, raisins, dried cherries, and chocolate chips). Customers can build their own trail mix by scooping items into paper or plastic bags. Then pay by the pound (set up a scale at your sale). Having a breakfast bake sale? Make it muffin themed and serve up some of our Kidstir muffin recipes, such as Churros Muffins, Apple of My Eye Muffins, or the Quiche Cupcakes from the Kidstir Breakfast kit.